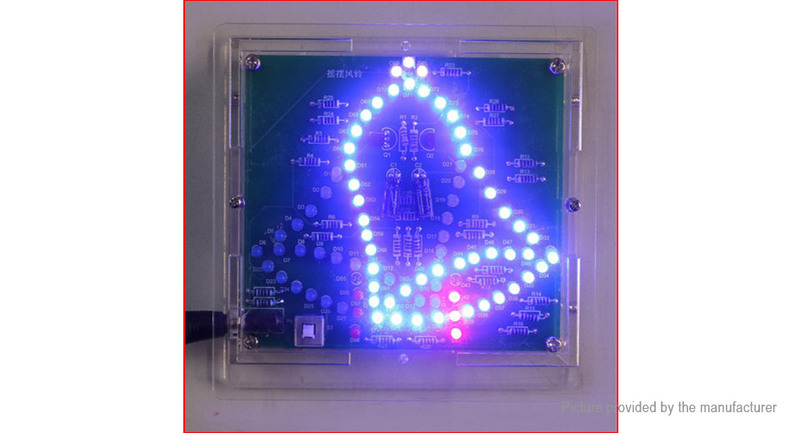 Composed of Q1, Q2 harmonic oscillator, to control two sets of LED lights flashing alternately, 83pcs LED arranged in a swinging bell shape. Because the parameters of components can not be exactly the same, so when power it on, Q1 or Q2 will switch on, assuming Q1 switch on first, Q1 collector voltage reduce to 0V, this time group A LED light; due to the voltage across of capacitor can not change suddenly, Q1 0V collector voltage through C1 makes Q2 base potential is also reduced to 0V, Q2 turn off, at this time the group B LED does not light. As the charging voltage of C1 increases, when rises to Q2 and switch on voltage, Q2 is turned on, Q2 collector voltage drop to 0V, this time the group B LED light emitting; Similarly, 0V of Q2 collector via C2 made the base potential is reduced to 0V, Q1 off, at this time group A LED does not emit light. Then C2 charging start to repeat the process, making two sets of LED alternating continuous cycle luminous. Wherein C1, C2, R21, R22 determine the frequency of two sets of LED flash alternately, changing their parameters can be changed the wobble frequency.